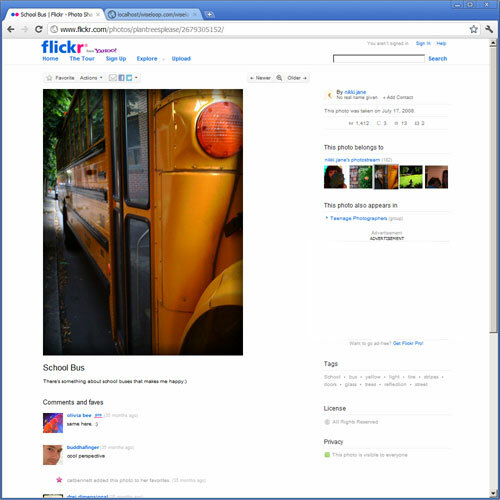 We need to create an image gallery hosted on our server but using the pictures provided by flickr. Both the thumbs and the full size images will be grabbed from the flickr and downloaded to our localhost using PHP Web Image Grabber class from the WiseLoop PHP Web Media Grabber package. The image gallery will be displayed in within our website and nobody will know that the pictures are coming from flickr. Grabbing and downloading media web resources form websites are the things that WiseLoop PHP Web Media Grabber is about. This package allows complex media extraction in a flexible manner, just by using only a few lines of code. 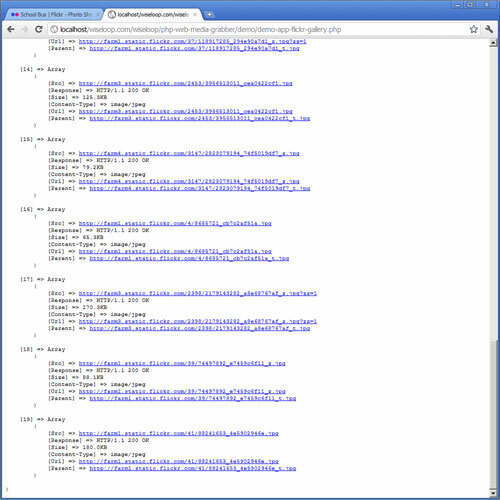 The extraction is made from any given web URL that contains or refers media files using web links (a href tags), various tag attributes (src, embed, param, movie etc.) or even inline css styling attributes (such as background images); also, the media grabbing engine is able to identify more than the obvious media resources having the most common file extensions - it will find the media generated dynamically by the servers or media files that have no valid extensions or no extensions at all (such as images generated at runtime by the web servers); the identification is made by checking the server response header when pinging the tested media resource. Step 1.4: include /php-web-media-grabber/bin/wlWmg.php in your application. We want to grab and download to our host all the pictures presented here: their thumbs and their full size image that hides behind the thumbs links. We will use the PHP Web Image Grabber class to grab and download the targeted url images, and then some short PHP custom code to nicely display the gallery. All we need to do is to create a wlWmgImageGrabber object and pass to it the url page address to be processed. 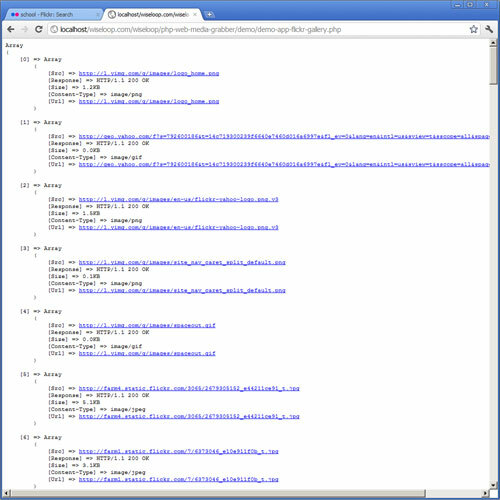 the grabbing engine was able to identify and extract the images, but no download to our localhost was performed. If we do not need all media to be extracted from a page we need to setup some filters and add them to the grabber filter list. To create a filter we must instantiate the wlWmgFilter class by calling its constructor with some arguments (see the class documentation). Also, some filters can be automatically added to the grabber object by passing some additional sets of values to the grabber constructor. Yes its better, but there are still some unwanted pictures in our grab results (some of the buddy icons from the right are jpegs). 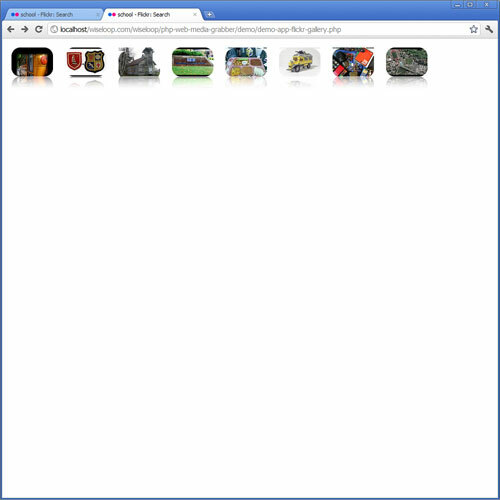 This is a very strong feature: the grabbing engine is able to search for images (or any media) only inside a designated HTML area specified by a tag; in this way you can skip grabbing from the start any unwanted pictures by narrowing the full HTML target page to a smaller area consisting of a tag content; an incomplete tag (tag slice) can be specified also, the tag will auto-complete depending on the contextual HTML content. 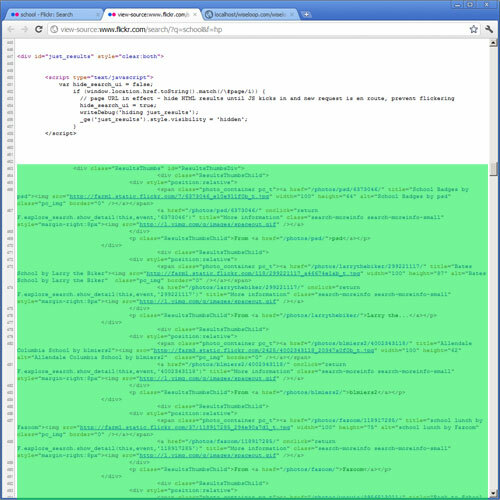 In order to do HTML area searching, we need to know a little bit about the HTML DOM structure of our target page. Quite smart. Isn't it? Notice that we did'nt specify the full tag definition: we used only a slice: 'photo-display-container'; the grabbing engine was able to identify the full tag depending on the full page HTML source code. This can be very helpful when even the tag that delineates the designated searching HTML area is dynamically generated, but it has some static properties that can lead to its unique identification (such as CSS class, or ID). Just for fun, let's pretend that we do not need all the images, we need only the first 10 pictures - we'll have a 10 picture counting gallery only. Now we are sure that we have grabbed the needed thumbs. How about the full size images that hides behind the thumbs? Oops; this is not very good for us. Of course, we (human beings) know what is the full size picture of the followed thumb: obviously it is the bus. But how about a computer program (our PHP script)? Does it know that? There are many images in that pages: the flckr logo, the bus, the buddy icons from the right, some commercial banners, the buddy icons from bottom etc.). How the computer will identify the full size image that it has to extract? The largest picture (in bytes) will be the needed picture. 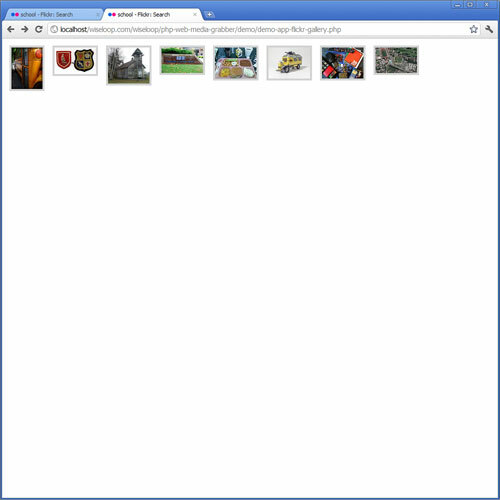 It will check every picture contained by this sub-page and the largest (in bytes) will most likely be the one that we need. Wow! that was real sloooooow! Why is that? Because the script had to check every sub-page hidden behind every thumb, and for every subpage it had to check every picture contained by that sub-page in order to find the largest (in bytes) one. That can lead up to thousands of url checkings (pages and/or images) that can even reach the PHP timeout limit error. So, let's fix that ok? Ok, you already know what this is about. What if we limit the searched are in the followed sub-pages like we did for the main page at Step 5? Yes if we know what tag holds the full size image in the followed sub-page the problem is solved. 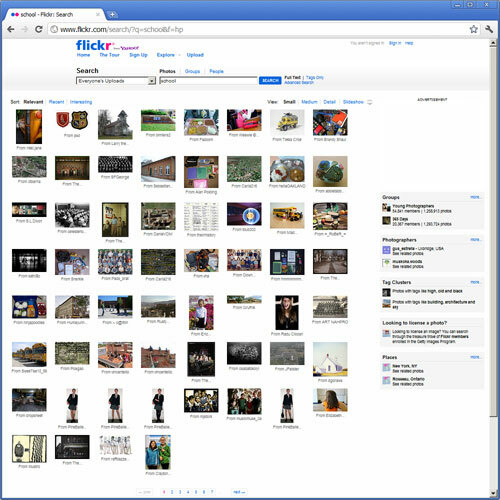 Please note the parent/child image relations feature: when grabbing image galleries with link following enabled, the followed thumbs are set to be parents for the full size images founded underneath them; in this way you will know for every grabbed thumb the corresponding full size image and vice-versa. We will follow a classical recipe for displaying image galleries: in the main page we'll show the thumbs, and after clicking the thumb the full size picture corresponding to that thumb will be shown. If we want our gallery to be more attractive we can also use a very powerful inline image processor provided by WiseLoop. By this time you can realize that WiseLoop PHP Web Media Grabber is a powerful tool that can help you develop complex specialized media grabbers for various websites. You could wrap the code above into a nice class that can behave like a native grabber in order to grab, extract and download from flickr with only 3 lines of code!